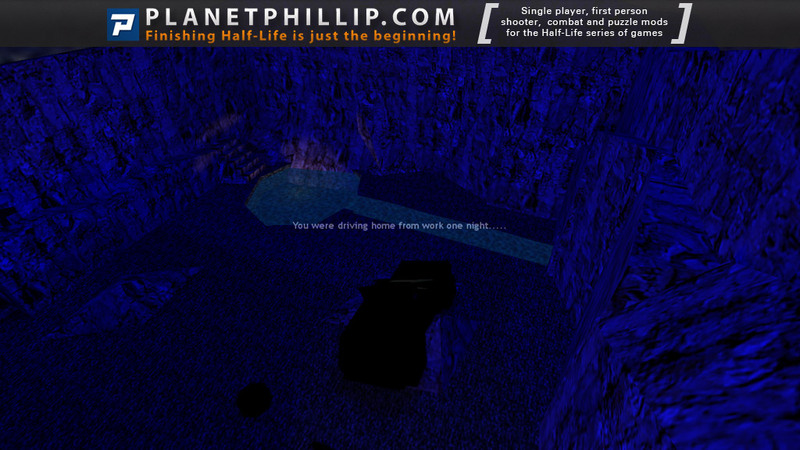 Copy crash1.bsp to crash7.bsp into your Half-Life 1 Maps folder. 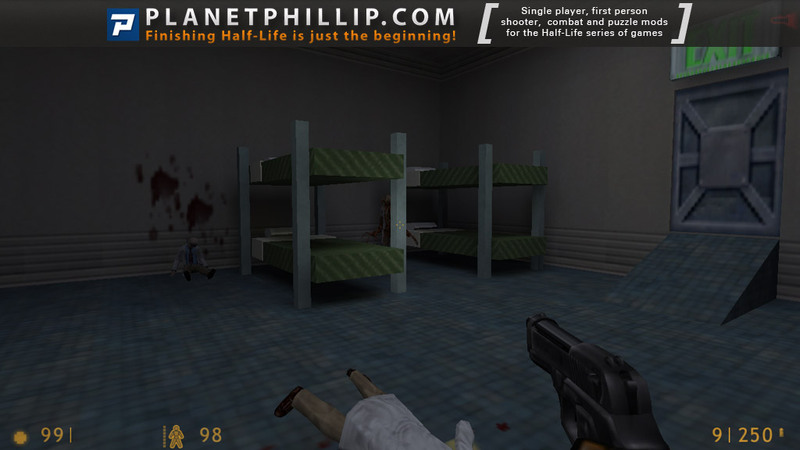 Copy the contents of gaphs folder into your Half-Life 1 Maps/graphs folder. Open the console and type map crash1. 7 maps. Enjoyable but short. Fairly good shootin” an” button pushin” experience. Play on skill 3. Z-fighting all over the dang place; very rudimentary blue, red, and white lighting schemes; elevators with three buttons all within a few feet of each other that you can pause midway by pressing the button (not to mention sending it back down on your head with the inside button as pressing the button outside sends it away; you just walk into the door to get in, unlike well-designed HL and real elevators – thankfully my elevator-sense saved me from a humiliating Elevator Action style death); chairs that break into metal or glass gibs, and one soda machine that doesn’t work while another mysteriously does; vents that go nowhere; sealed up elevator shafts and spaces behind doors and even between elevator doors and walls that can’t normally be looked into and thus just waste space; ugly prefabs, nonfunctional prefabs; “big box level” design for outdoor areas (apparent due to ultrathin water zone bounded on both sides by air – I never got why people put water brushes around their maps); two zombie scripts right next to the player (temporary invincible zombie effect). On top of all that, a level transition zone at the end of map 5 that failed to activate. Picking up the crowbar and SMG before the suit makes sense in this scenario but of course you can’t fight in that state, and you’d need to know how to switch weapons without your HUD. I did somewhat enjoy looking around some of the maps, particularly the almost barren last one, but that lasted for a little over five minutes only, cataloging the various level design no-nos contained within. 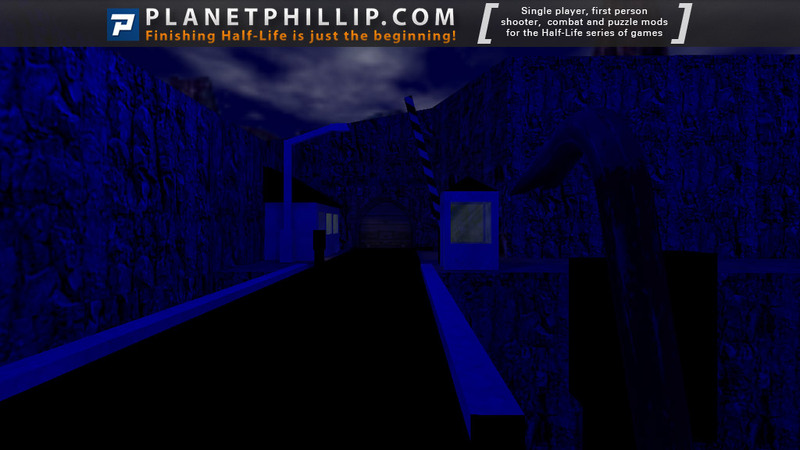 The ending is…You enter a completely empty map with lots of strange details in the geometry that you normally won’t see, and the way to the “exit” is just to the left of where you start. Hit that brush when you open the garage, another all-black SUV comes out, drives a way until it crashes into the letters CRASH made out of blocks, which then have parts explode during a credit sequence. One of the best executed parts of the whole thing – not very nice to the player character, but funny. 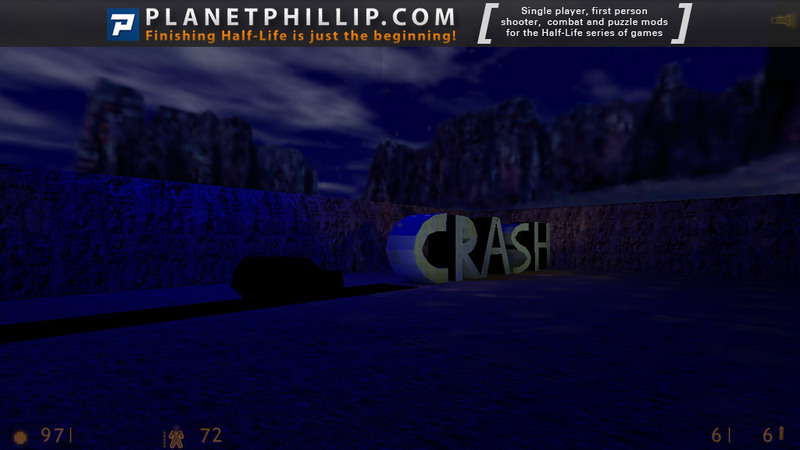 Then the camera does something, comes back to the CRASH logo, and slowly pans out of the level while the music plays. Then you get control back (you’re back at that door; your character never gets in the SUV after all!) and you can run off to inspect the dodgy geometry, try swimming into the roof in two inches of vertical water (I didn’t have the patience for that – I did get behind the far canyon wall, however) and play with the bundle of snarks under the crash logo. 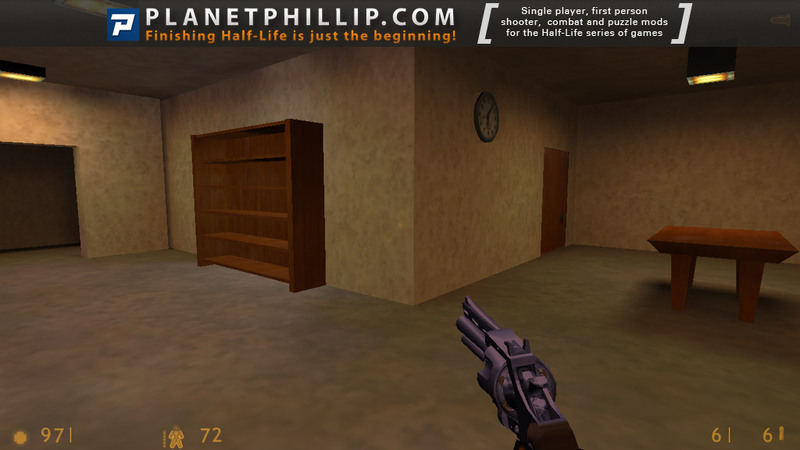 Then you delete the maps from your \valve\maps\ directory. The list of a half-dozen playtesters must be a joke, even before the impossibility of blaming Steam for the broken level transition. As it stands, there’s very little of value here – it’d get two stars from me for the effort, main idea, pleasure of not needing to smash zombies with a crowbar for half an hour, and if it weren’t for the bugs and general inconsistency in everything. For once I don’t mind not being kicked back to the title screen – we could pretend this is like Morrowind after beating the main quest. Of course it’s more satisfying to manually quit the game. The above is too harsh. It’s enough to frighten off any modder who isn’t a highly skilled pro. Did “Ed” try it on a different PC? No crashes and no level loading problems on mine. None of what Ed says above detracts from the gameplay. 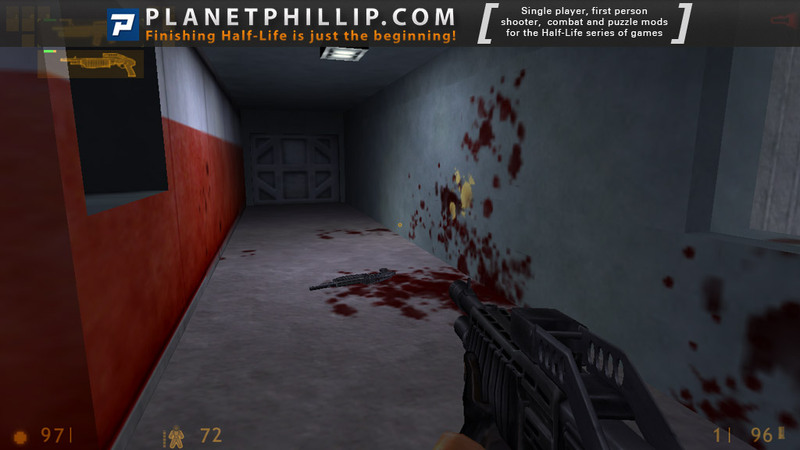 There are many much worse HL1 mods that you really should avoid. (Try Graf War for instance). This is not one of them. Consider it. Did “piledriver” read my post? I didn’t say the game crashed on me. All my comments are directed towards clearly marking what could be improved up to the ending. Not sure I go over the line for letting out the tiniest bit of frustration at having played and wasted time on this mod; I’ve seen worse on here and it’s not usually backed up with facts and examples like my post. Yes, I didn’t focus much on the shooting gameplay here, but I’m more exploration-oriented than shooting oriented, especially on a map that seems to be a test of modding skill (which, as I note later, it doesn’t completely fail). Yes, I didn’t make allocations given “it’s just a mod;” I’ve been a HL diehard since launch and I don’t think that people just coming to the excellent modding scene or coming back will stay long if I rate things higher than they should be. The fun stuff will be rated higher because that’s what people want to play. There’s no reason to make this personal, and that response was unfortunate and rude. I have a right to my opinion and I think you’re out of line to tell people to ignore my post. They will read it and factor in my lack of mentions of gameplay only if they so wish. Focusing on something different from other people is called freshening the air. I made a good effort simply to catalogue the problems I ran across in case anybody cares to find out what sorts of things could be improved here, and I don’t think at that point I’m offensively negative about it. I wrote that review the last day the “Too Buggy to Play” button was around; I use the rating not by the star but what the label actually says. It says “Avoid It!” and that summed up my thoughts. It’s remotely possible I messed something up on that transition zone in map 5, but not because I didn’t spend a long time looking for a trigger, and that wasted time had to be factored into the rating. The zone in question is a small rectangular room at the end of the large two-tiered room with railing on the top floor and the elevator with three buttons on the same level. The transition zone should activate immediately when I get into it. I shouldn’t have said anything about the Steam install, since that was obviously not at issue and I can’t accept responsibility for anything but playing it wrong. I should have stressed more that it wasn’t just some random bugs that made me dislike the mod. I see z-fighting and all the other things mentioned in some other mods that are otherwise enjoyable, but I would view them more favorably if they bring the gameplay. This one unfortunately doesn’t, in my view. I did note that it has some high points, and if people read they’ll see those too (although I probably shouldn’t have spoiled the ending, it seemed to me a good example of the showing off the mod’s author was aiming for). tl;dr Internet Opinion, serious business. Perhaps you’d like to point out where I was personal, unfortunate or rude, or where I told people to ignore your post? Nothing like that is intended. The comment “you could download worse” is directed at anybody who reads it, not just you. I was trying to say that none of the faults you pointed out affect the gameplay and it is worth the download. I hope this won’t be one of those “Fluffy the Hampster vs Kasperg” things! I just replayed this today. Short, but I thought it was a lot of fun, and fairly well made for one of the early mods. It played fine on Steam. I did have the one small bug, that the level change on the two tiered room didn’t load the first time, but when I went back a level and went down the hallway with tripmines and the Fire door, then the other level change loaded just fine. Firstly, let me say that I didn’t do any gamma colour correction as recommended in the readme, so if my screenshots look different from yours, that could be the reason. I quite enjoyed this mappack but perhaps its the 100SDoN starting to get to me but everything is beginning to look the same. The two houses were done quite well considering how long ago they were made and it’s clear the author tried to add some little touches, like the zombie climbing out of the elevator shaft. But then the whole thing lacks any really cool fight sections or areas. There’s nothing that makes this release stand out from almost hundreds of others and the more I play these maps, the more important I feel that is. All in all an average mappack and whilst I agree with Ed, I also agree with Piledriver that they don’t affect the gameplay that much. I didn’t get to the empty map and I did have trouble with the level 5 change. I suggest jumping around the doorway. 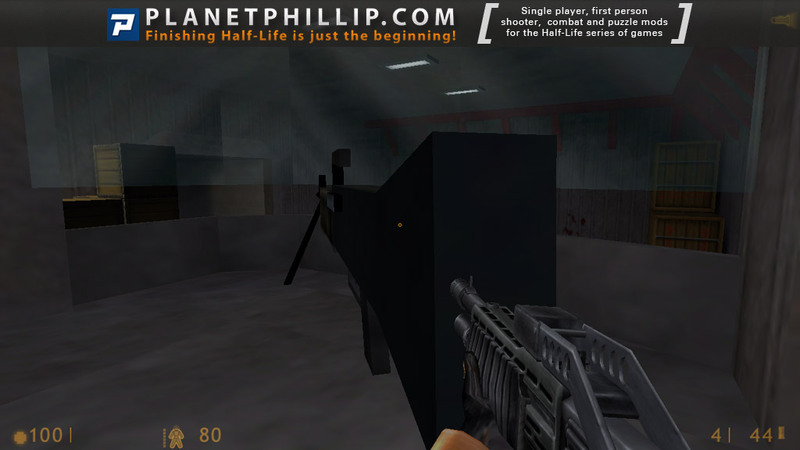 MP-5 as the main semi machine gun, in the HL game? ?, I only have the MP5 is it because of the verssions of the game? ?, I maybe have an older verssion, i’d preffer that cool m-16 of yours than my old boring mp5! !, do u now if there’s a weapon replacement for Hl????? 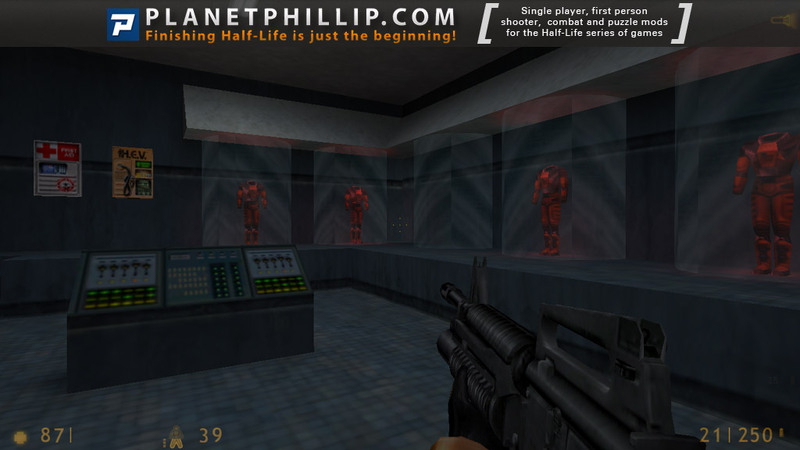 Hec, that’s the High Definition model pack for Half-Life. It was originally packaged with Blue Shift, but has been made available for download and also for Steam. 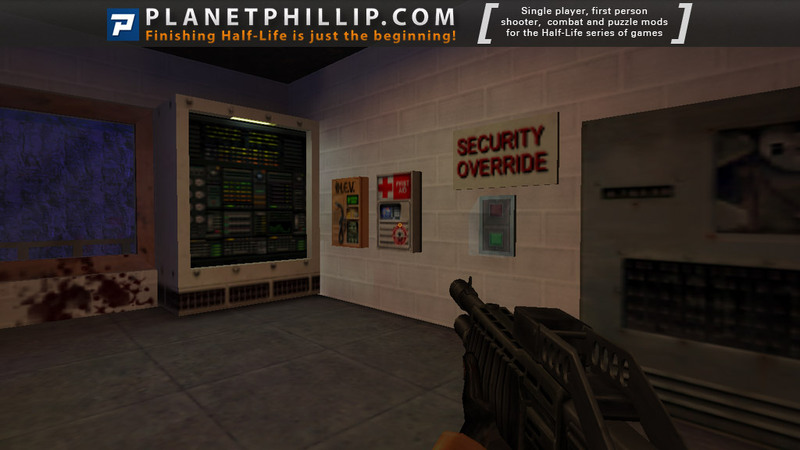 Valve has provided the HD pack, but the one you want is linked here: http://planethalflife.gamespy.com/fullstory.php?id=105708 since it correct some missing animations. 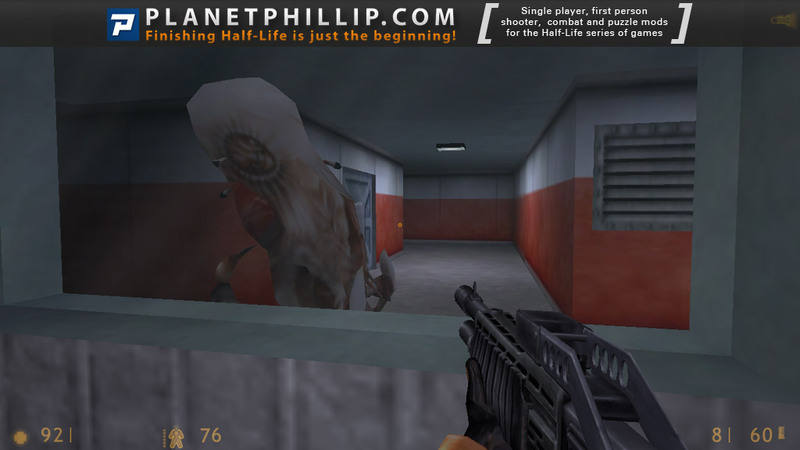 However, it will still cause the problem seen in the title screenshot on this page – there are a couple zombie animations that are just frozen in place (although the official Valve pack is actually missing them). Hec, that’s the High Definition model pack. It originally came with Blue Shift but was released for download and for Steam later on. 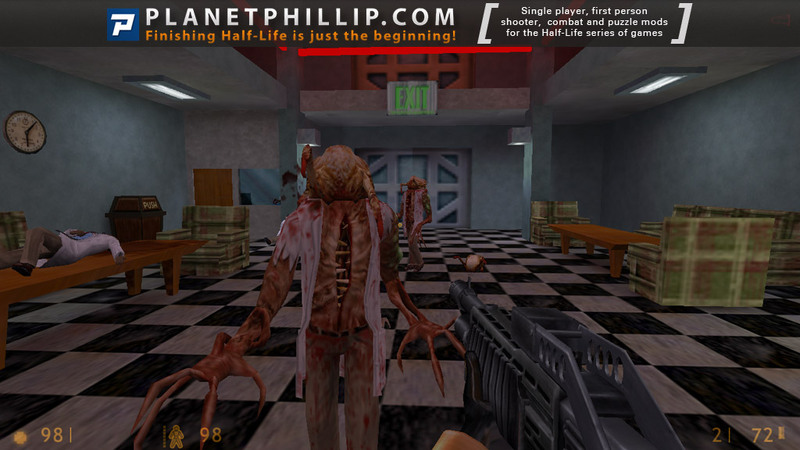 However, it will still cause the zombie problem seen in the title screenshot above. This “fixed” pack has that animation (while the Valve one is missing it), but it’s just a frozen pose instead of the actual (unused) sequence in the low-def model. Oh many thanks buddy i’ll try the High def-pack! 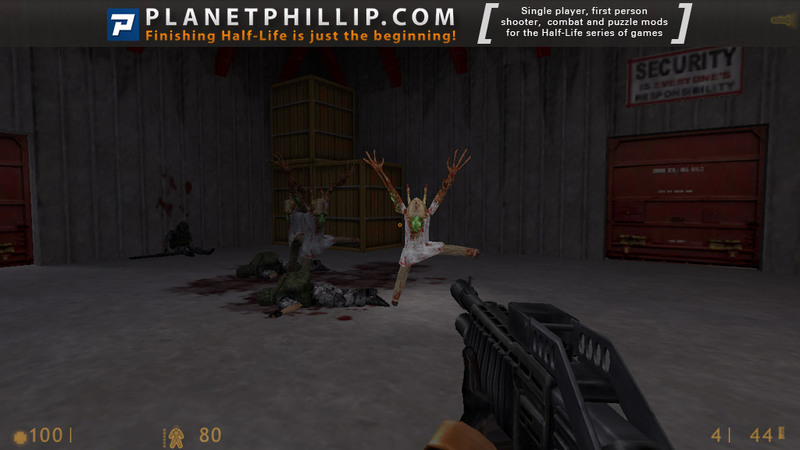 Oh, I forgot to mention I had a funny bug where some of the zombies got stuck in that crazy dance pose, seen in a couple of the screenshots. First time it happened it was strange because as soon as I got close then jumped into normal mode. Kinda wish something like that was part of the design. Yes that’s due to the HD models missing some animations. However I think there was a version of the HD models released that included the missing animations. I’ll let you know once I get home tonight and play this pack to test the HD models that I use in Steam. I was missing a couple maps, which I noticed were all quite lengthy, so I doubt I can get to them anytime soon. 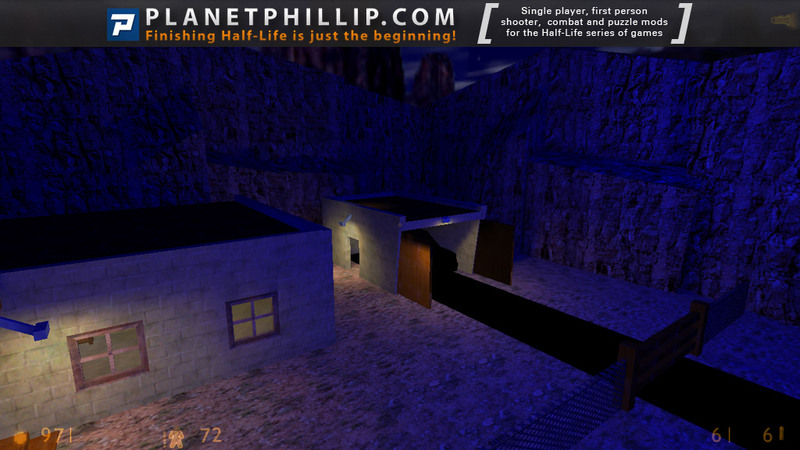 But this mappack, Crash, is one of the first custom maps I’ve played, so I tend to be a bit biased in liking it. Make no mistake–this is not that good. 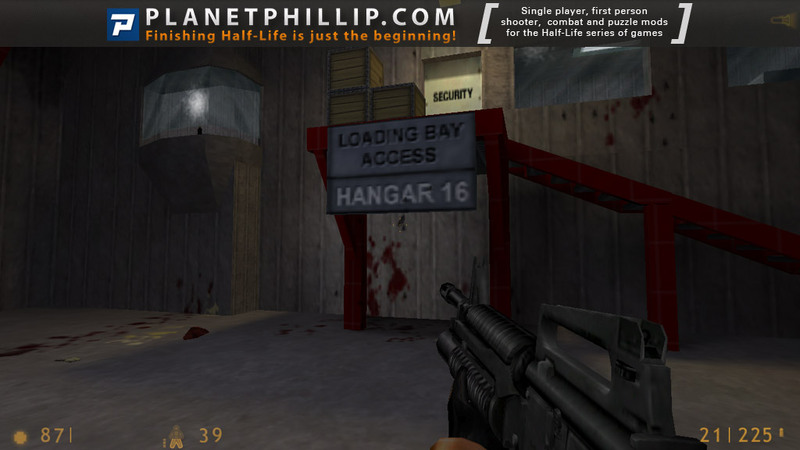 I do notice the boxy design and generally boring architecture, but it does make for a fun gameplay experience. 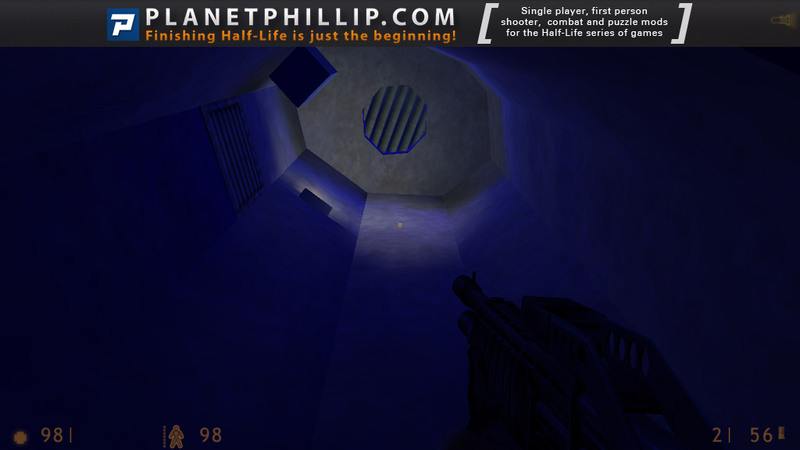 Also, for once, the setting isn’t entirely in some Black Mesa Lab or Storage Warehouse. Instead, you will also be traveling around BM in night outdoor areas from residential house to house in your bid to escape. There are some interesting scripted sequences, like the one with the kingpin and snarks so that will spice up the game a bit. Fun. The final map is horrid, and the map transition to it is really broken, but overall I think it’s alright. Not great, but alright. You prolly don’t want to try it if you want something good. 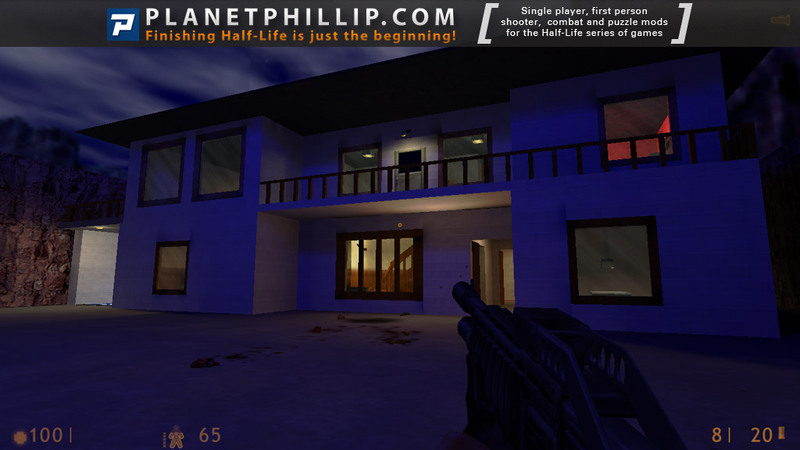 This mod bases its story on a supposition that there were secret entrances to Black Mesa which looked like houses. After car accident, the driver went to search for help, and found one of them. There are some nice cutscenes, and the ending looks cool. The locations have interesting layouts and the fights are challenging. You can enter the house from the first floor, or take the outside elevator to the second, which increases the replayability. There is some optional exploration. The scene where the door opens and headcrabs go in looks good but it’s not thought out well enough. It’s not possible to kill headcrabs while they are going in and it’s possible to go through the door and get stuck there. The author should have made a cutscene to avoid all these bugs. 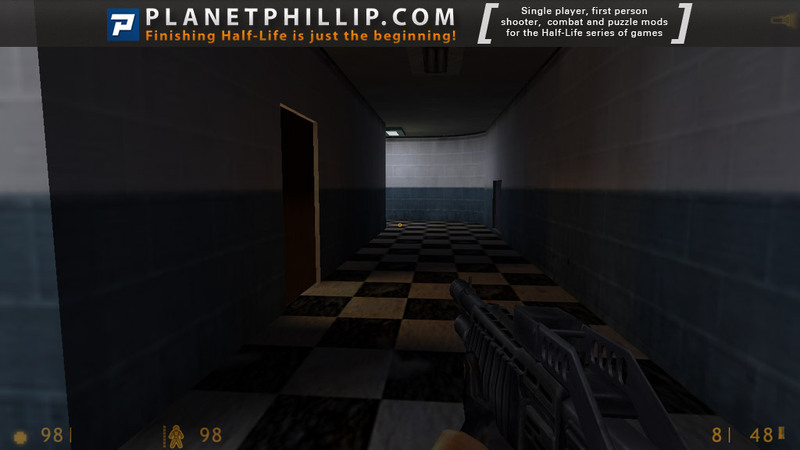 The design is boring at some points, and the ending doesn’t return you to main menu. If you wait for some time, you’ll be able to wander around. The ventilation shaft made very big just for the bullsquid to fit in there makes the place look unrealistic. 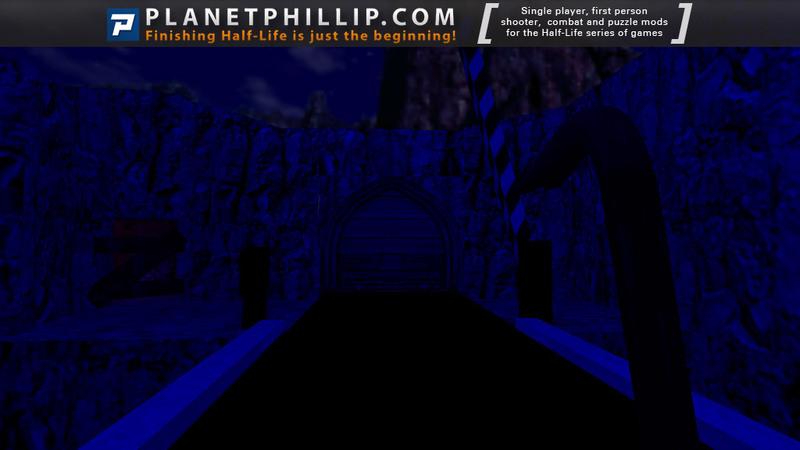 Not only this one, but all ventilation shafts don’t look convincing, because they are not textured properly. And flat mountains are not convincing, too. When I exited the last elevator, it continued to sound like it was moving. There is some originality in this mod, but the author didn’t thought it out well enough and didn’t put enough work into it, so I can recommend it only to players who don’t mind boring design and bugs. First I have to say that I was happily surprised to see little intro. And I think that overall idea of this mod was interesting. But… boxy mapping without any real deep details. 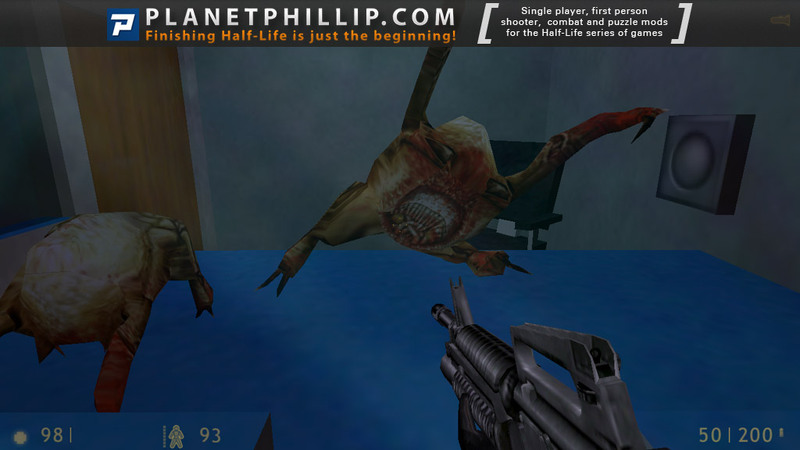 Like I said in my Kitchen mod review, I like to visit houses etc in Half-Life (yea, I like OneSneakyMouses rats maps 🙂 But there was not much to see. There is so much potential, but it’s all unsed here. I would love to give high rating, but just can’t. Would be cool so see this redone with current mapping scene. “Revenge of snarks” was like “wow, whats happening”… Kingpin and all the scripted scenes.. Without being too critical, the mappack plays fairly well without ever reaching any great peaks of achievement. There’s plenty of action but it’s not that challenging with amble weapons, ammo and health on hand. The set design tended to be on the bland side with texture looking flat and lifeless, if made of cardboard. Clearly the author seems inexperienced, without too much idea on how to dress a room with incidental content. Many areas looked bare, whilst other appeared to have no bearing on the plot. The basic and boxy style of design persists throughout and is easy forgettable, however, accept for a few elevator glitches the game flows from one encounter to the next, although most Grunt firefights are feeble. Nevertheless, it’s worth a play being better then few others of late. Personally I thought this was a boring map pack. This is another action map, with puzzles similar to that of Shadows which results in you just pressing a button to open something else. Unlike Shadows however, the action is pretty boring. Not much else to say about the game play. The three things I liked about it were the intro, ending and first house. It was also nice to see another that follows some kind of storyline, although why the protagonist went from crashing his car to fighting grunts in their house I’ll never know. The ending was pretty cool to look at too. What was with the snarks underneath one of the CRASH letters? Meh, I didn’t like it. It’s also a shame that after such a good run earlier that the 100SDoN has started to fizzle out a little. I’m sure we’ll get some great ones soon though. 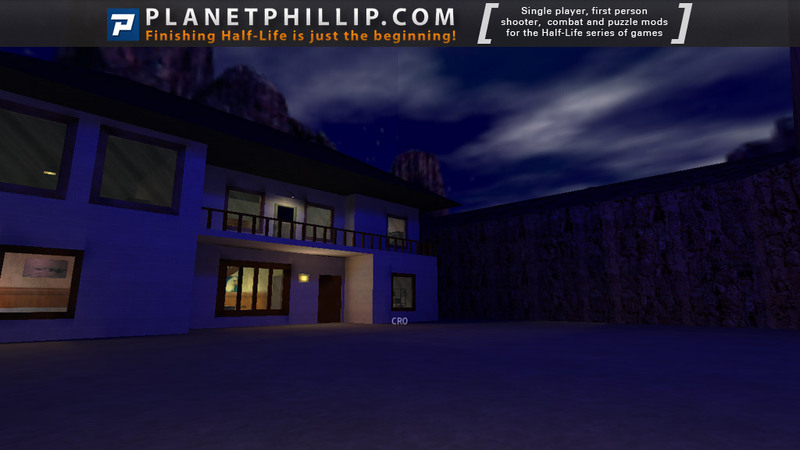 Well, I’d say this worth the effort enough to play it, I mean is really unique, is like an art experiment into Black mesa, I really don’t know why those buildings like houses were in there, like a residential part into BM, I felt those parts so out from the BM environment, so that’s something to take care of, I don’t really know why this mod having so much beta testers, didn’t care that repeting part where u found the HEV suits I mean first u found it into the house and then u found the HEV suits and the crowbar again into BM complex so that’s something that fail in that mod, but in general it feels with cool combat and that ending part was really odd, because u get out of another buliding similar like a house again get into the garagge and stole an SUV to get out of there, and then u crash on that big CRASH sign so that was a wierd ending especially for a stranger who had to pass by BM hell on his own…..
Well I was waffling between a Think Twice and a Maybe for this set of maps. Perhaps because it’s a holiday weekend and I’m oh so slightly less jaded than usual, it’s getting a Maybe. The author sets up kind of a flimsy story, but does give a handy tip: play on skill 3 (hard). I think for the average player that this pack is better balanced on hard. Combat can still be tough but at least you’re fairly well-armed, and health is pretty common. The opening section seemed really rough around the edges. Blocky rocks and overscaling issues combined with poor lighting to make a generally bland area. I did like the house, however, and the multiple paths to get into the house and the combat situation you get into once hitting the button. Overall the rest of the pack has some good ideas, scripts, and combat, but also bland architecture and the lazy tricks like vents only deep enough to hold the aliens waiting to ambush you. In all it’s kind of balanced things out, so this pack gets a Maybe from me. 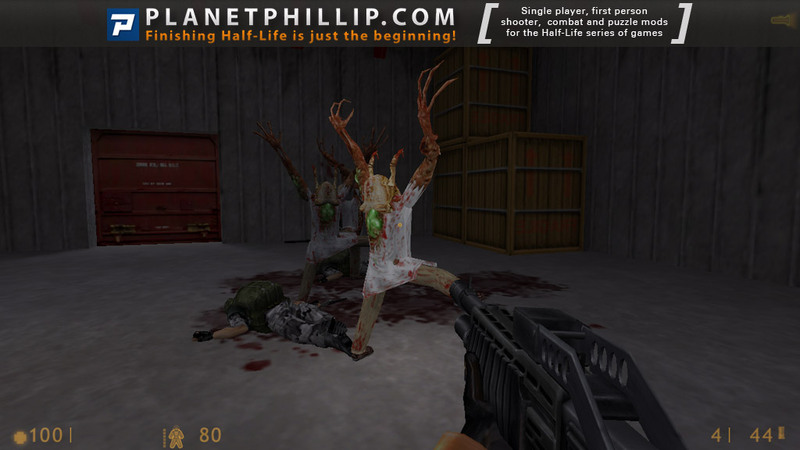 And yes, that weird zombie pose happened to me too, it’s an issue with the HD model pack. I suspect Sigurd must have played They Hunger part 1, released about 6 months before crash came out as it too started with a car crash. There the similarity ends and goes downhill from there. 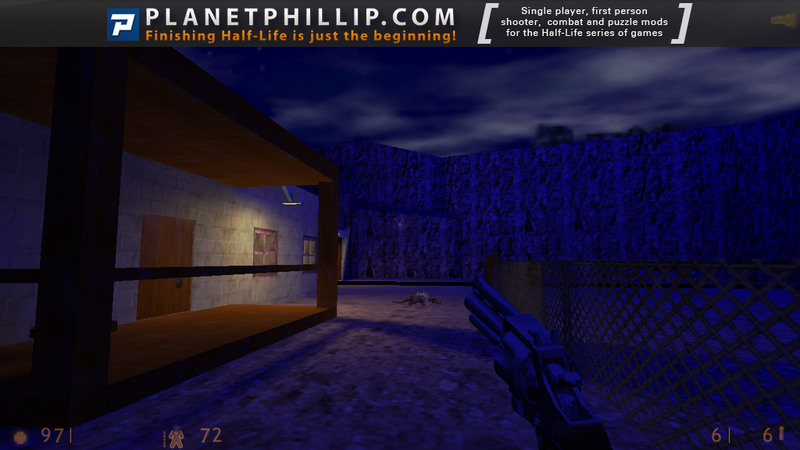 This just feels ordinary as far as HL1 mods go, but then not every one at the time could be on par with people like Neil Manke. The game-play was average at best and the layout was like some others of the 100, Lego Blocks! The lift outside the upper back part of the house is how (I assume) the grunts got to where I had already cleared. Its difficult to say anything positive about this contribution and the only thing I can come up with is “I’ve seen worse”. I was tempted to give this a WOW but I only gave it a PIN because of some technical problems. I mean this mod was just pure FUN. It got off to a somewhat rocky start but it was really good in the long run. 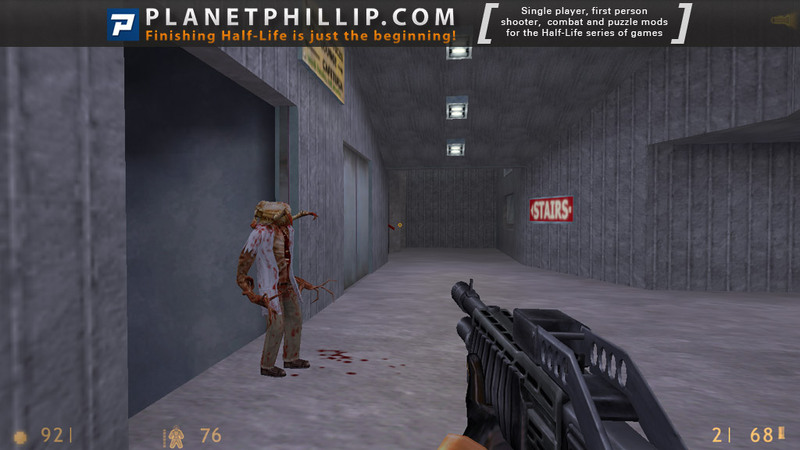 We’ve had a rash of decent Half-Life efforts from new authors recently and I was interested to find out if Crash would continue that trend. 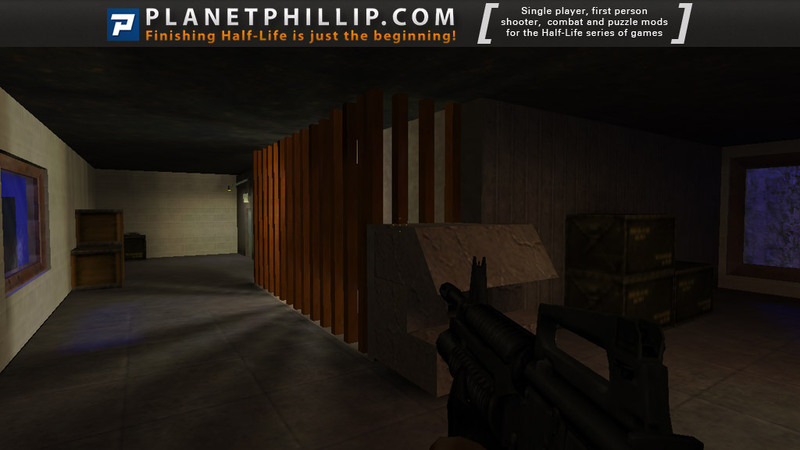 Unfortunately, it’s a slight return to the lower standards we were forced to become used to after the Half-Life mapping scene was born; though it’s not a bad level as such, there are few reasons why it’s one you should rush off and play. The visuals are generally tidy and occasionally verge on impressive but do have that look familiar from so many first attempts. Levels don’t have the kind of empty feeling that you’d often expect to find as well but, on the other hand, they are rather sparsely populated: even if you play on the highest difficulty level as the author recommends, you still won’t have an awful lot to do combat-wise in this unit. There are some good points – I especially liked the very effective night time atmosphere he created in the outdoor sections and the first house looked pretty good from the outside – but they were too rare. This review is republished here by permission and was originally published Wednesday, 16th February, 2000 by Morgan. While I enjoyed playing this mappack, it didn’t make me feel that satisfied as I hoped. 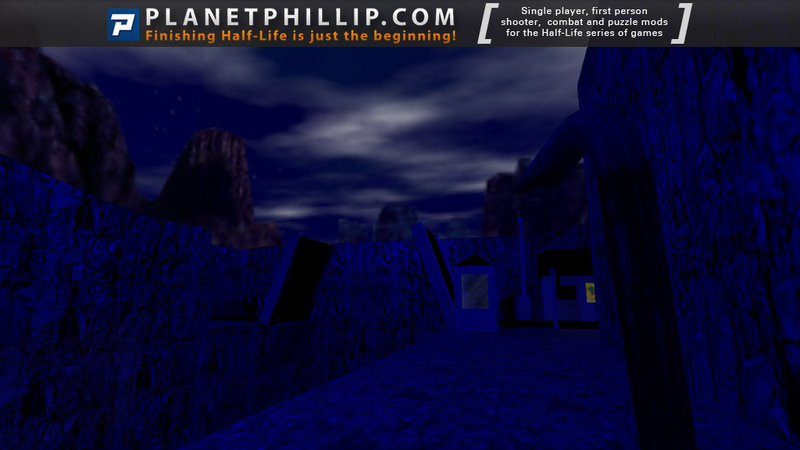 The beginning was rather blocky, ugly and very dark. Also, the car was only black to me. I don’t know if that was by the dark lighting, or because something’s wrong with the WON version. At some point there is a mounted gun sequence, which is kind of buggy, but it adds some variety. Overall, a really decent mappack.